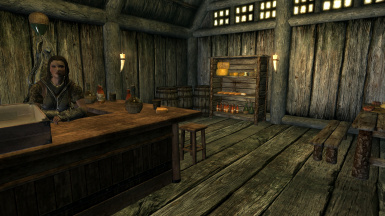 Rebuild the ruined farmhouse west of Whiterun and run your own shop to sell your loot! Been adventuring for a while? Got too much loot and nowhere to sell it? Maybe you should open a shop! 7500 septims, and can only be done after you've visited the location. Once purchased, the ruin is completely rebuilt into a tavern and store, complete with empty mannequins and display cases! You'll have to provide your own inventory and hire a shopkeeper to tend the store while you're out adventuring. Version 2.1 is a major overhaul that significantly improves the ambiance, adds numerous new features, fixes almost every bug, and is compatible with Breezehome Store. See the changelog below for more details on the changes. Version 2.2 is a minor update to version 2.1 which includes (hopefully) some bug fixes and improvements in preparation for porting to SSE. If any players out there are able to manually install this mod in SSE and test it for me, I would really appreciate any feedback! This mod was created after I published my Breezehome Store mod and several people requested a stand-alone version that did not mess with Breezehome. 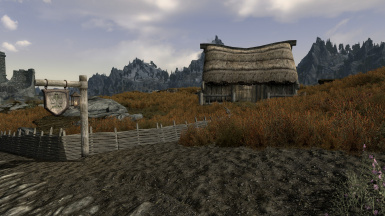 When you investigate the ruined farmhouse northwest of the Western Watchtower, you'll have a new "miscellaneous" quest objective to talk to someone in Whiterun about the property. Go speak to Proventus Avenicci in Dragonsreach and he'll tell you the land is for sale - though it was destroyed by bandits from Fort Greymoor which is dangerously close. He'll sell it to you for 7500 gold, a bargain if you ask me! Once you buy the property, the farmhouse will be rebuilt as the Drunken Dragon shop and tavern. 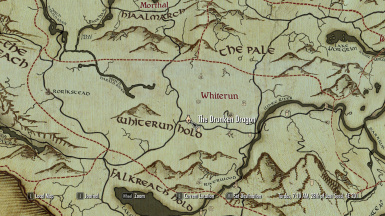 A new map marker will be added to your map to show you the way and make fast travel easy. You'll need to hire a shopkeeper, but any generically voiced follower will do - just lead them into the shop and then speak with them to offer them the job. They will stay at the farmhouse and tend the store while you're out adventuring. You can dismiss your shopkeeper at any time or hire another follower to be your shopkeeper instead. There is a "Shop inventory" chest in the basement of the farmhouse which acts as a container for all your loot. Any items left in this container are available to your shopkeeper to sell (yes, you can speak to your shopkeeper and view his wares and buy your own equipment from him or sell your loot to him). 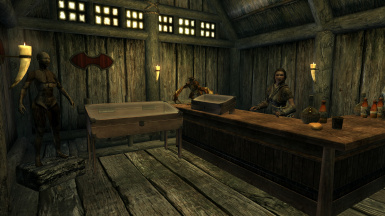 Several times throughout the day, even when you're gone, the shopkeeper will make a sale and deposit your share of the profit into a safe in the basement. You'll need to return to the shop in order to collect your earnings. Any gold you place in the inventory chest will be safe and will be available to your shopkeeper through their merchant dialogue. There's also a non-respawning chest under the stairs opposite the inventory chest and safe. 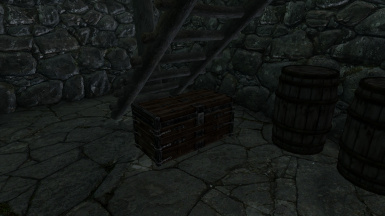 This chest is safe to store any items you don't want to lose or sell. You'll make about 60% of each item's full value when it sells (to cover your shopkeeper's wages and taxes). Works with all kinds of items except player-enchanted items. 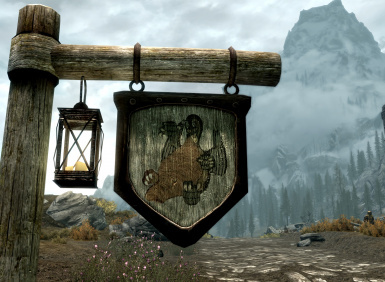 Due to a lack of functionality in Skyrim's script language, any items enchanted by the player will be sold at the value of the unenchanted base item. There is no way around this; I recommend selling any player enchanted items to another vendor in-game. 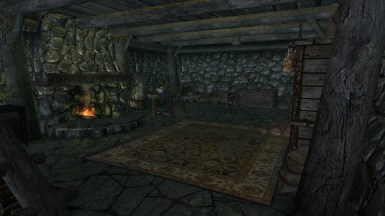 Some players may want to redecorate according to their own tastes by using Jaxonz Positioner to rearrange and decorate the Drunken Dragon, as seen in some of the user uploaded screenshots. There is an invisible quest running in the background with a script on it. At random intervals (varying from 1 to 4 hours) between 8am and 8pm, the script will go through all of the items in the Storeroom container and pick one at random to "sell". The script calculates the value of the item, removes it to Oblivion, then deposits 60% of that value in gold into a safe in the shop. If the total value is under 100 gold, the process repeats itself until the total value of all items sold is over 100 gold, and then waits another random interval before starting over. Ammo is sold in bundles of 20. Only items in the Storeroom are sold this way. Anything you use to decorate the shop with stays put and is not sold. Extract the files directly into your \Data folder. If you are upgrading to Version 2.1, I recommend that you remove all items and objects from version 1 or 2.0, exit the store, and create a clean save by unloading Version 1, loading your game, saving again, then loading version 2. While it may technically be possible to install Version 2.0 directly over Version 1.0 without a clean save, I haven't tested it and I suspect it will break everything. Grab your follower and leave the shop! Exit Skyrim and disable the mod. Open Skyrim and load your game. This mod will not be compatible with any mod that edits the wilderness area where the burned down farmhouse is. Mods that mess with Papyrus scripting or Proventus' dialogue may also be incompatible. 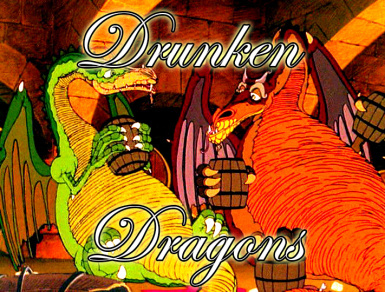 As of version 2.0, The Drunken Dragon is fully compatible with Breezehome Store. 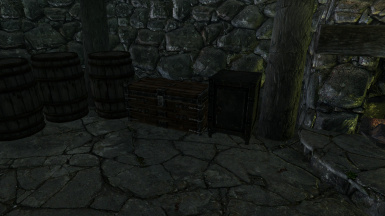 After hiring a shopkeeper, items placed in the inventory chest may not show up in your shopkeeper's merchant dialogue until after restarting Skyrim and loading your game. This does not affect the sale of any items in the chest. Followers using the FemaleSultry voicetype don't have all of the voiced dialogue. This is a flaw in vanilla Skyrim. Because the follower dialogue is not "shared", mods that correct the follower dialogue won't work with the Drunken Dragon. Version 1.0 - Rebuild the rubble into a player-owned store! Add a proper uninstall script. Right now some changes will be permanent. Add Hearthfires compatible construction quest. 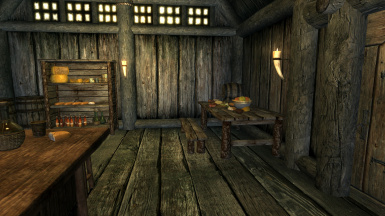 Add option to rebuild the farmhouse as a cozy player home. Convert the shop into an inn for weary travelers. new features will take a back seat to earning a paycheck. And many thanks to Bethesda for making such an awesome game and for making the construction set that lets people like me with way too much free time modify the game. And user indycurt, whose request and persistence motivated this mod.